You’ve heard of the “Three Rs” — reduce, reuse and recycle. And there’s “PPPs” — public-private partnerships. Sharif is the President of the Municipal Council for Seberang Perai, Malaysia, a city of nearly 1 million north of Kuala Lumpur. Appointed by the state government of Penang in 2011, she’s the first woman in the city to hold what is essentially the job of mayor. I spoke with Sharif recently at a gathering of mayors at the United Nations. She told me what the Four Ps and Rs are all about, and also reflected on what it means for her city to have a female mayor. This interview has been edited for length and clarity. Christopher Swope: Tell me about the Four Ps and Rs. Dato’ Maimunah Mohd Sharif: Let’s start with the Rs. When I took over the mayor’s post, I realized that we would like to improve our revenue, and we would like to reduce our cost of doing business. If we have the revenue, then we can provide more facilities and amenities for the people. Our budget is around $US 200 million. But when I went in in 2011, we were spending 42 percent of this on solid waste management. A: Yes, it’s quite a lot. I was invited to present our case in Kawasaki, Japan, and when I mentioned that solid waste management is 42 percent of our budget, our Japanese friends asked ‘Did you say 4.2 percent or 42 percent?’ Because it’s close to 4.2 percent there. They were shocked. Q: What do you mean by ‘rethink’? A: I use this example at schools. You want to eat, you go to the canteen. You rethink. Maybe normally you take two cookies. But your tummy is already half full. Just take one. Because otherwise, it becomes waste. In my city, 50 percent of the waste is organic — food waste. And the food waste is very, very heavy compared to the other waste. Or take toys. There’s a mother who told me her son wanted to buy extra toys. And his big brother told him the mayor said to ‘rethink’ — you have so many toys already at home. Rethink. It’s been very well received. Now in my city, it’s like rethink, rethink, rethink. Q: How is ‘rethink’ different from ‘reduce’? A: When you reduce, you already want to consume. You used to consume big, now you consume small. But now you rethink: Maybe you don’t need to consume. You don’t need to generate waste. Because it’s already enough. We also say when you eat, you eat until you finish. First, you rethink. Your tummy is full so you take only one bread not two. Rethink. But the moment you take the amount that you want, you have to finish it. Because I don’t want it to become waste. Q: How has this changed the bottom line on that 42 percent of your budget spent on waste management? A: In 2015, it was reduced to 32 percent. That’s about $US 9 million. Q: Do you think these messages are part of what’s reduced that? We also have a program called ‘sustainable residential area.’ We have a competition between neighborhoods to reduce waste generation. Our city workers collect rubbish three times a week. In those areas that commit to do the sustainable residential area, we only collect once a week. This reduced our spending. We also promote composting of kitchen waste. My city is the first city in Malaysia to ban free plastic bags. Now if you want to use a plastic bag, you’ve got to pay 20 cents. Styrofoam is also banned. Q: What about the Four Ps? A: The Four P’s are about how to manage and maintain public space. There’s public-private partnerships. But there’s also people — this is your neighborhood. I already provide you with the facilities. Can you adopt it? Can you take care of the space so that there’s less cost to the city in maintaining it? Another way is developers or multinational corporations or any other concession can adopt the public spaces. They can improve it, and then they sign with us for five years for maintenance. They maintain it. But we give them the right to advertise their product. It can be parks. It can be a street, it can be a roundabout or a traffic island. We have 34 ‘Four P’s’ project for parks already. Q: How much revenue does that bring in? A: It’s not so much about revenue, but saving me from maintaining the parks. They maintain for five years. They provide the facilities, and they maintain for five years together with the people there, the resident association. Not only can I reduce my cost of doing business, but I’m also building the trust within the people. I trust you as a mayor, and you trust me. Q: How else do you build trust with the people? A: Every year, before we do our budget, we call a town hall meeting and we ask the people, ‘What do you want us to prioritize with the money that we collected from you?’ For the first five years, cleanliness was the top priority. At this year’s town hall meeting, the percentage of stakeholders saying cleanliness was the top priority was down to 26 percent, meaning that our city has now become cleaner. We are very transparent. We show the people how much we collected. The spending goes to this, this and this. That’s where we build in the trust among the stakeholders. Q: Can I ask you, as the first woman to lead your city — is there something new you bring to the discussion in your city that maybe wasn’t there before? A: I think so. The first thing to me is public engagement. Because we ask the people. Another thing I’m bringing in is activities. Because I realized that a city without activity is a city without a soul. When I came in, I asked my employees, ‘What do you do after Monday to Friday?’ They said, ‘Nothing.’ Then I went to the open spaces, the public spaces, and they were very quiet. I said there must be activities in the city. I started aerobics in the public spaces. Exercise. Now Zumba. Many people said, ‘Why the heck does the mayor want to dance in the big field? Don’t you see we are shy dancing?’ I said no, because with aerobics, I meet the people. And people like music, it makes them happy. Slowly I’m bringing my office and services to the people. I have a mobile office, so even on Sunday they can have services. I bring this mobile office to the aerobics. And people can talk to the mayor and also take care of any rates they have to pay or licenses they need to apply for. They can even pay with the credit card. I also bring my nurse. Just do a simple health check. Before they go for exercise, they can take their blood pressure. They enjoy it. Now every neighborhood wants aerobics. I also started an activity called car-free morning, when we close a street and say the street is yours. You can dance, you can lay down, you can bring your kids, you can do cycling, you can do whatever it is on the street. It’s every first Sunday of the month. Now the demand is, can you do two Sundays of the month? 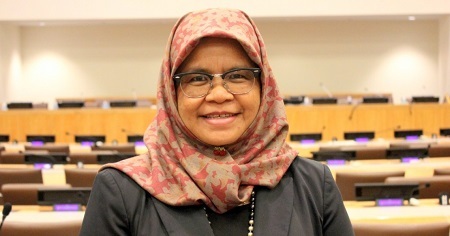 Photo: Dato’ Maimunah Mohd Sharif is the first female mayor of Seberang Perai, Malaysia. Source: Christopher Swope.